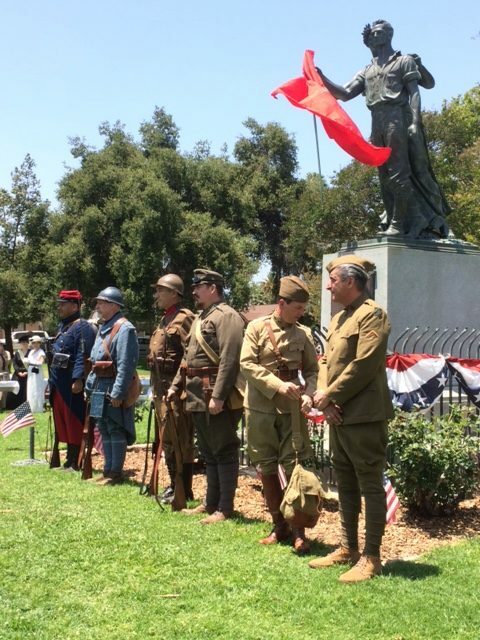 A World War I re-enactors group, the Great War Historical Society, lined up Monday prior to the sword unveiling at Pomona’s Garfield Park. 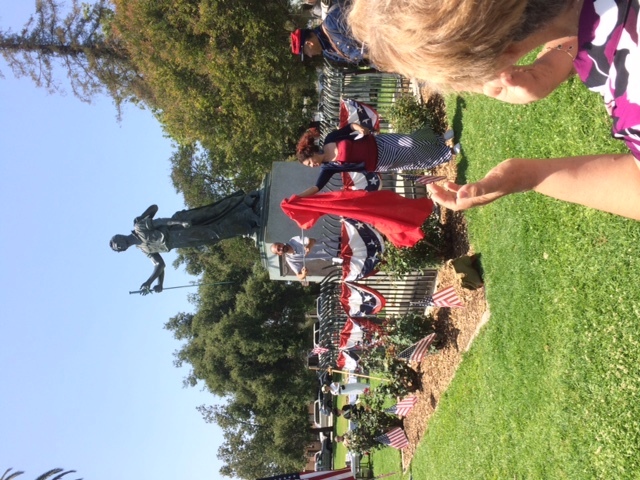 Below, Rubio Gonzalez of the Historical Society of Pomona Valley gets the cloth off the sword. 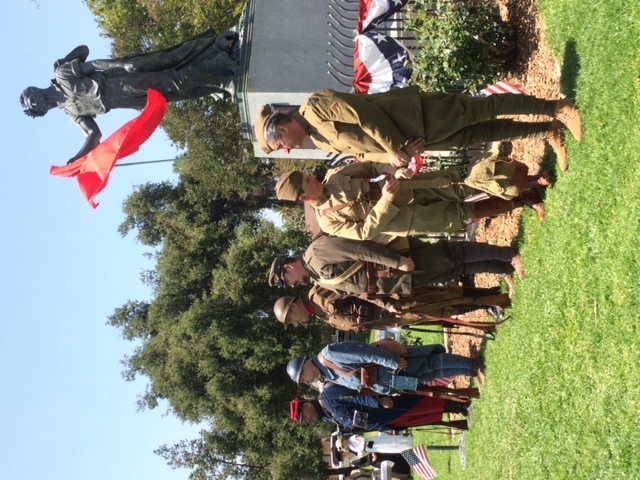 And below that, the re-enactors file past the reconstituted statue. Can you say “photo op”? 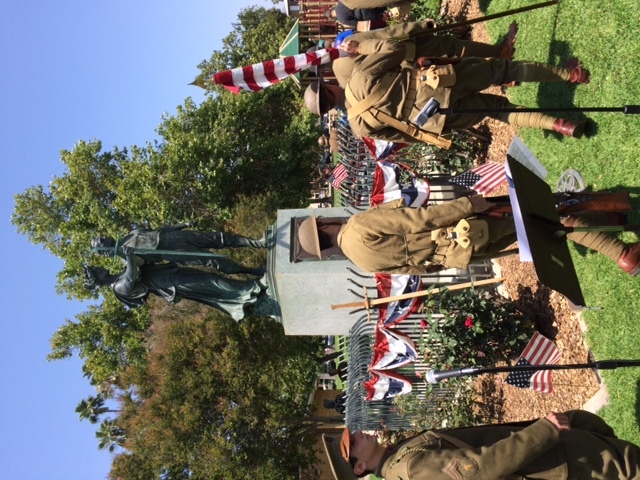 After all, the statue was dedicated in 1923 to those who lost their lives in the Great War. 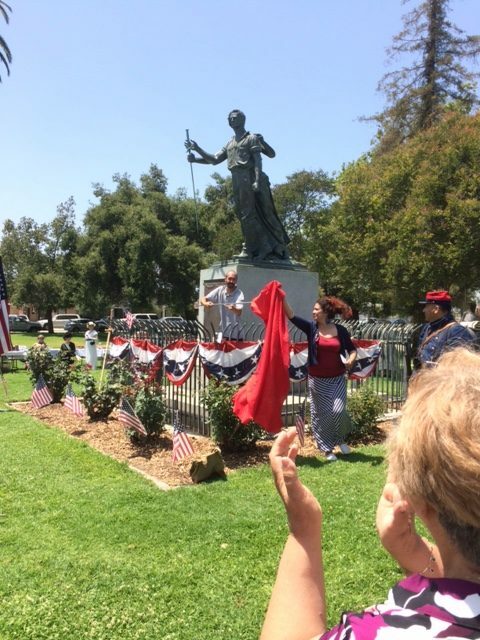 The bottom portion of the original sword was broken off by 1975, based on a photo in the Pomona Valley Historian publication, and later was stolen completely. A new sword was made nearly a decade ago but has been kept in storage. It was put up Saturday night, covered, lasted until the unveiling (whew), and is due to be removed Tuesday, to return to storage. 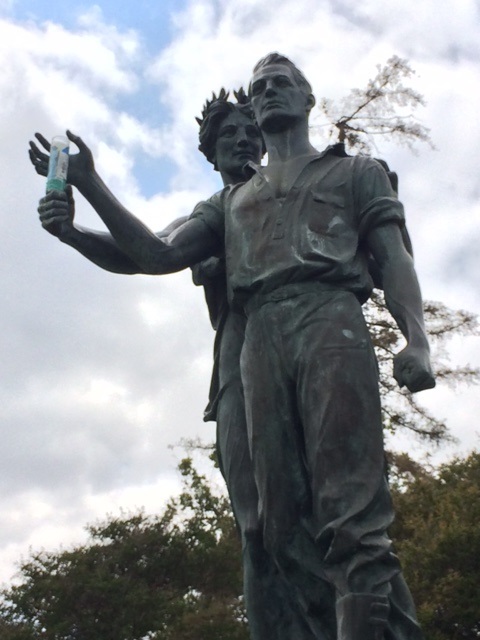 And by the way, what we had all thought was a bottle of water that some jokester had placed in the Goddess’ hand was actually a votive candle, which is more fitting for a war memorial than it had seemed. 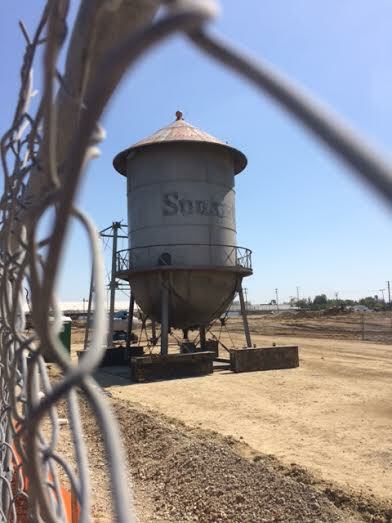 Remember the old water tower at the Sunkist factory in Ontario? It’s come down to eye level for refurbishment. That’s in my Sunday column, along with a bunch of Culture Corner items and a Valley Vignette. Friday’s column profiles a centenarian who’s about to turn 101. Her pals say she’s a an excellent pinochle player and also an excellent friend. 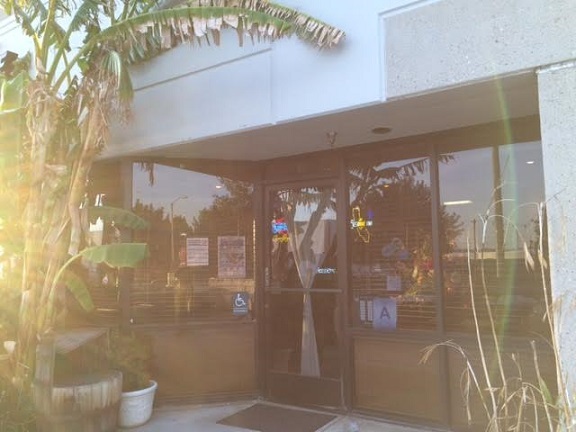 Zaky has locations in Rancho Cucamonga and Upland, both of which I like for casual Lebanese food. They took over the former World Famous Grill (!) in what some call Claremona, the portion of Claremont below the 10 Freeway. There’s a Starbucks and Denny’s next door. I hadn’t been to this one, but it’s similar to the others, only a little more stylish (what would you expect from Claremont? ), and with a visible grill. 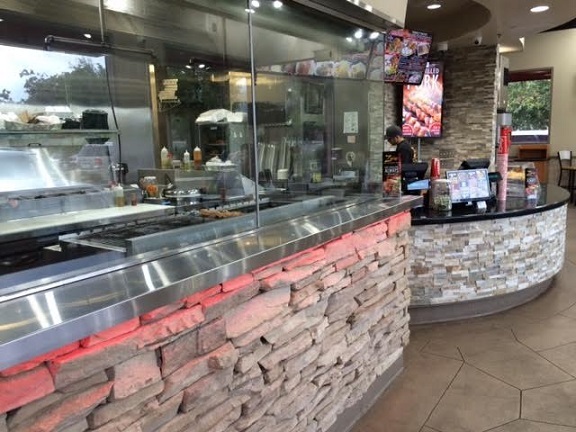 That’s the first thing you see upon walking in, before you even get to the counter to order. 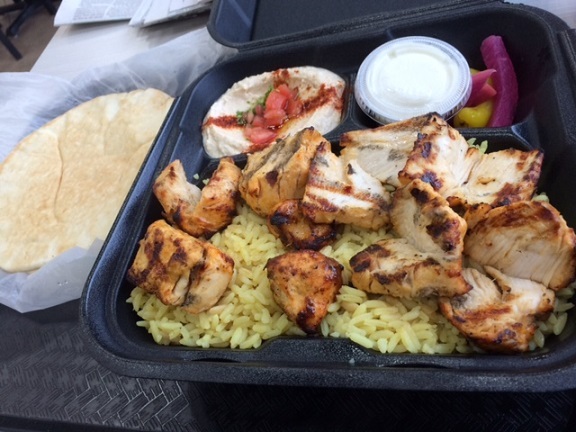 Zaky’s has wraps, kabob and shawarma plates and rotisserie chicken. Baklava was displayed in a case. 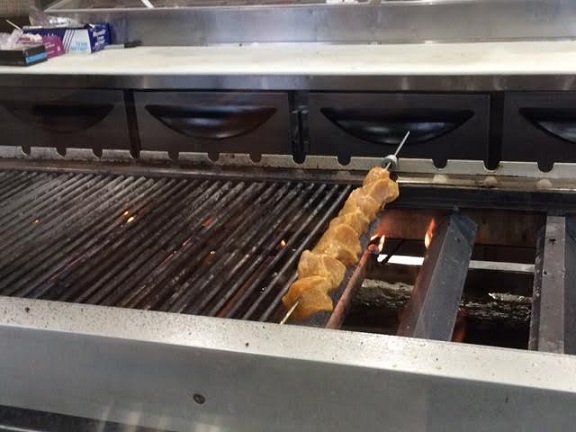 Immediately, a skewer of chicken was put in the grill before my eyes. My food took a little while, but it was well worth it the wait. Chicken is their specialty, and they know what they’re doing. The sides, pita bread and garlic sauce — oh, that garlic sauce — were all fine too. My only regret was getting two skewers: One would have been plenty. They’re now selling pork kabobs too. The owner gave me a couple of pieces to try. Unusual, but well done, even though the traditional chicken and beef are my favorites. 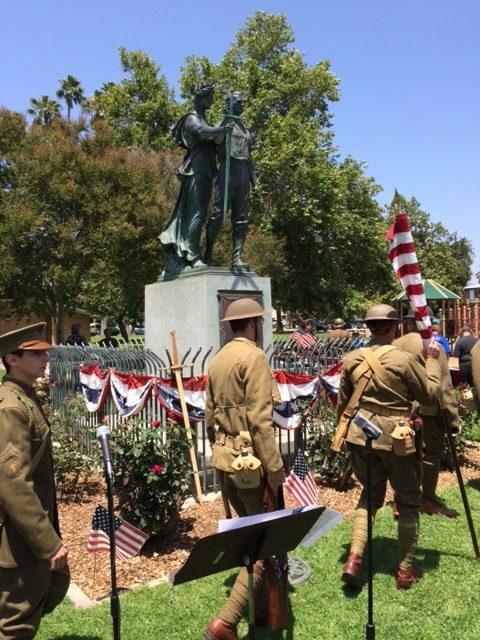 It’s an all-Pomona column as I write about the World War I monument in Garfield Park, and follow that with six Pomona items, plus a Valley Vignette from the same city. All the above is in Wednesday’s column. 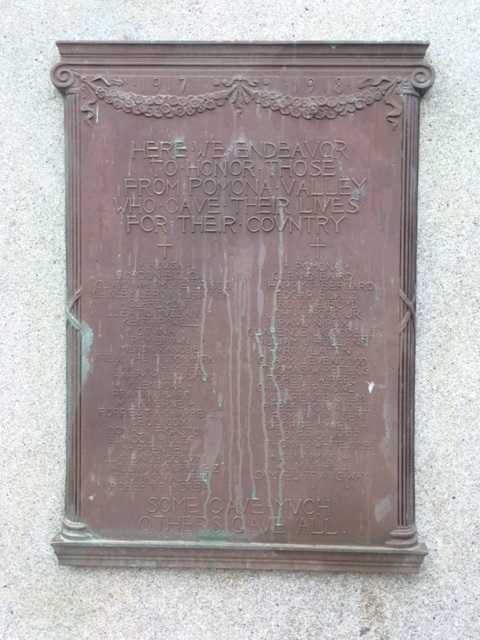 The dedication on Nov. 11, 1923 of the memorial for the then-recent first world war drew 5,000 people. 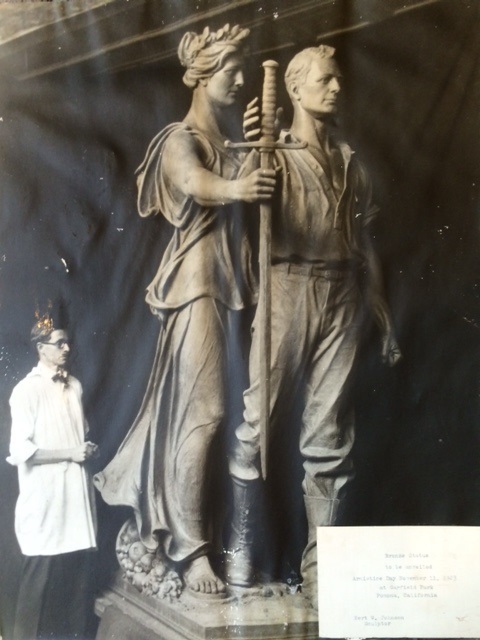 The monument is intact nearly a century later, other than the sword loosely held by the Goddess of Pomona, which has been stolen or broken and missing for some three decades. In recent years, she’s usually been handing the young worker a bottle of water. Heh. Claremont artist Burt Johnson sculpted the memorial. Below is a photo of him at work on the piece. It gives a good idea of the scale. It’s hard to judge the figures’ height in person because they’re elevated on a base. 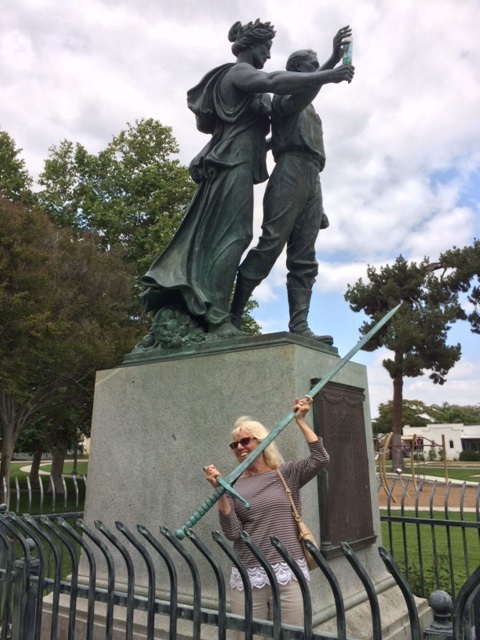 Mickey Gallivan, executive director of the Historical Society, is shorter than the 5-foot-6 sword, which has been cast by Glendora artist Richard Myer from photos. 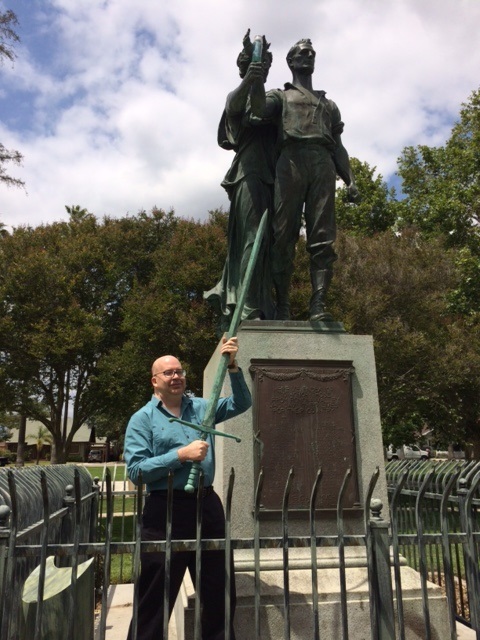 I’m not much taller than the sword myself. It’s heavy! Obviously it’s not a real sword or my severed fingers would have fallen to the ground, one by one. The stance was about the only way to be sure I wouldn’t drop the ($3,500) sword. In retrospect, I should have tried poking the bottle of water free. My Wednesday column will have more about the memorial. A service will take place at 1 p.m. Monday in which the sword will be briefly mounted. In our office’s move last fall, I found a 1998 Daily Bulletin and was entranced by the movie ads. 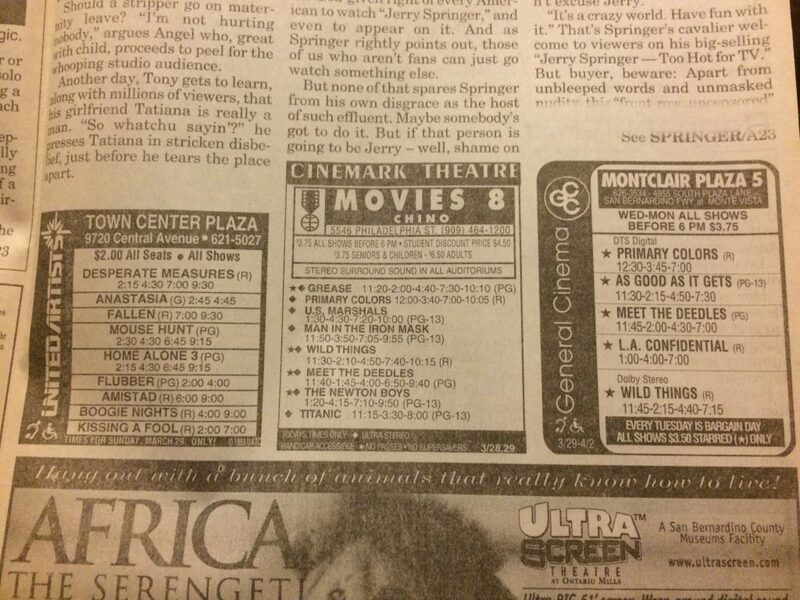 Like supermarket and help wanted ads, movie ads have migrated away from newspapers in whole or in part. These 18-year-old ads are of interest because many of the theaters don’t exist anymore. I don’t know the fate or status of them all, but the Mountain Green 4, for instance, is a Michael’s craft store. Click on the images for a more readable view. 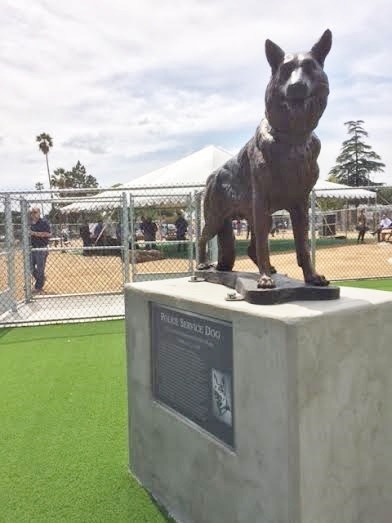 Taking a break from naming civic facilities after human beings, Ontario named its first dog park after a dog. Not one of the city’s founding canines (George Chasey? Charles Barkish?) 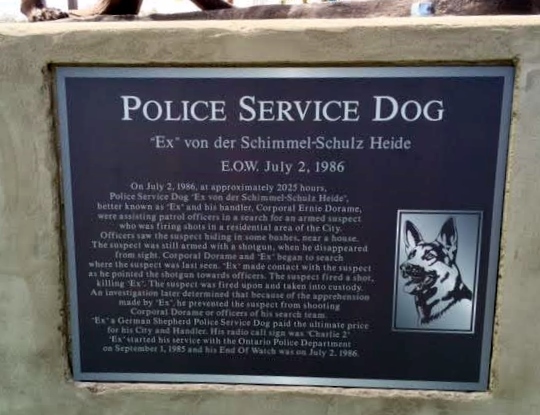 but rather a police dog, one who was shot to death in the line of duty. It’s an unusual story, which must be why I’m the one who wrote it. It’s my Sunday column. A gallery of photos from the event by my colleague Jennifer Cappuccio Maher can be seen here. Friday’s is an all-Claremont column — how did you stand the wait? 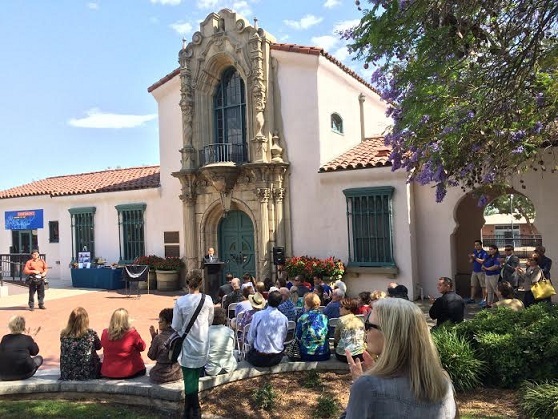 First, a long item about a ceremony honoring the late Judy Wright, who championed the preservation of the city’s 1927 train depot when it was not a popular cause. Then, six short items from around the city. Read it here. 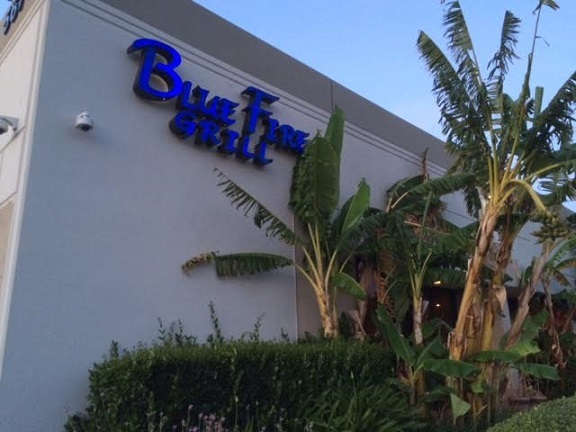 A colleague had recommended Blue Fire Grill to me a few years ago, but I had never seen it and, my knowledge of Chino still tentative, couldn’t picture where it was. The fact that I hadn’t been there nagged at me, though. Then one evening last month, I was downtown, and hungry, after the end of an early council meeting and thought, Where is Blue Fire Grill? I mapped it and realized it was only a few blocks away. So off I drove. Inside, the main dining room wasn’t being used (it was early on a Wednesday). 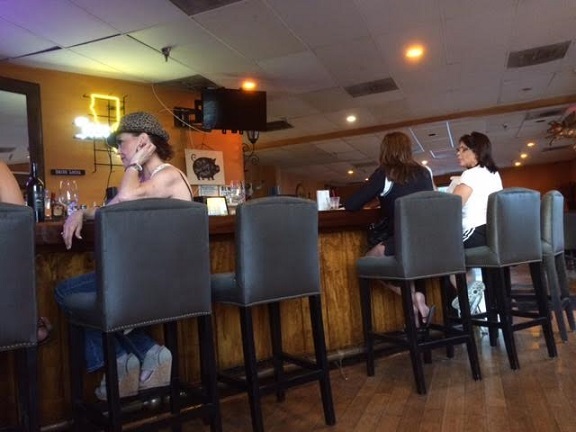 The half-dozen customers were all enjoying the wine bar. Yes, the wine bar. 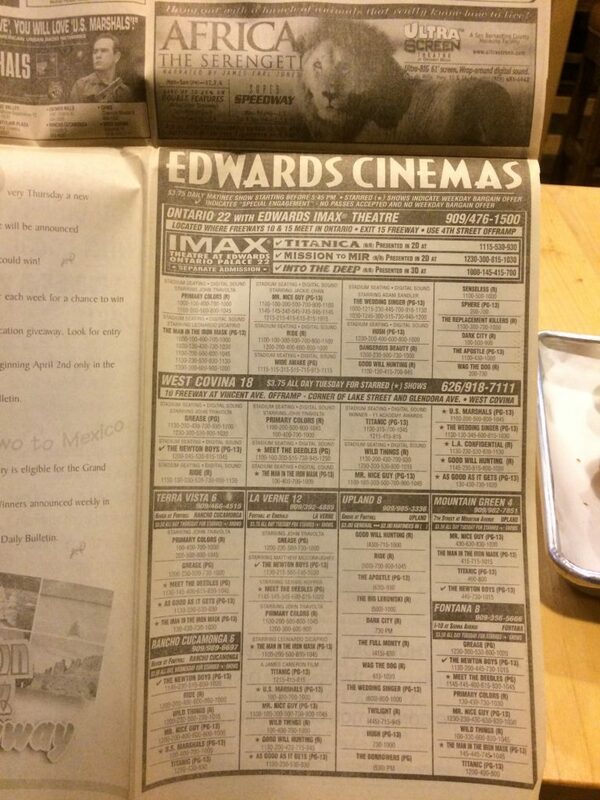 I sat at a table and requested a menu. Blue Fire’s menu is mostly barbecue, with a couple of salads and seafood items, plus pizza. (Yes, pizza. And a wine bar.) They do catering, which might be a big part of their business and made me more confident about ordering. I got the Texas brisket ($18.50), which comes with a salad and two sides; my choices were cornbread and mac and cheese. 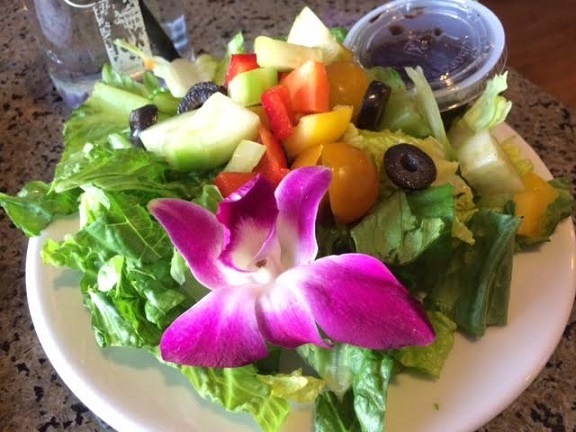 The salad was above average and had a flower as a garnish. It might have been edible but just as I was finishing, the entree arrived and I relinquished my plate. 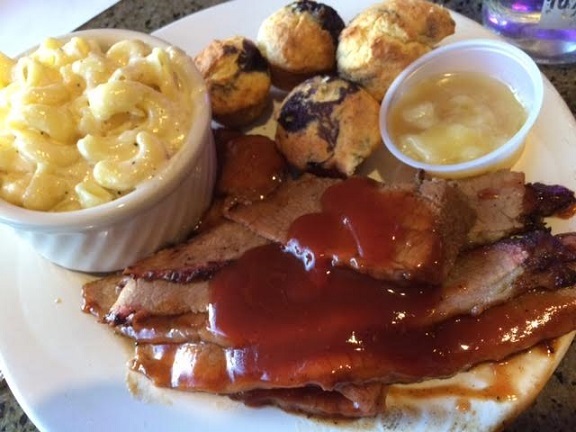 As for the main event, this was a lot of food, and pretty good: tender brisket, tasty and piping hot mac, with blueberry cornbread in mini-muffin form and a container of apple butter. The barbecue sauce was sweeter than I’d prefer, though. I ate all the mac, half of everything else and took the rest home where I got a second meal out of it. Blue Fire wasn’t my favorite barbecue, and being the only diner was disconcerting. But the experience was fair. Plus, maybe you’re interested in a wine bar…?